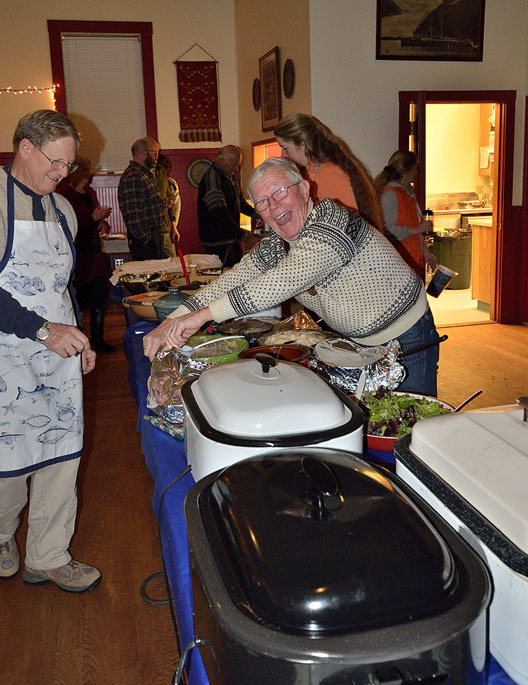 Last Sunday was the 22nd Annual Lutefisk Dinner at the Sons of Norway hall, and we decided to go early and help out since there was a call for volunteers. What is Lutefisk, you may ask? Lutefisk is a Scandinavian dish, described by various Norwegian friends and relatives as either a symbol of Norwegian pride and tradition, or a symbol of Norwegian shame. It’s fish (usually cod) that has been dried and later reconstituted in lye water; today it’s reconstituted in a baking soda solution. My Dad used to talk about enduring dinners of lutefisk as a young boy and he always hated it. I’ve heard that it’s an acquired taste, though two ladies I visited with yesterday both said that they really like it, and prefer the old way of preparing it with lye water. The end result is a fish that’s somewhat jelly-like, and it’s cooked by steaming or baking. So… being a town that prides itself on its Norwegian-ness, we must pay homage to lutefisk and hold a big buffet. 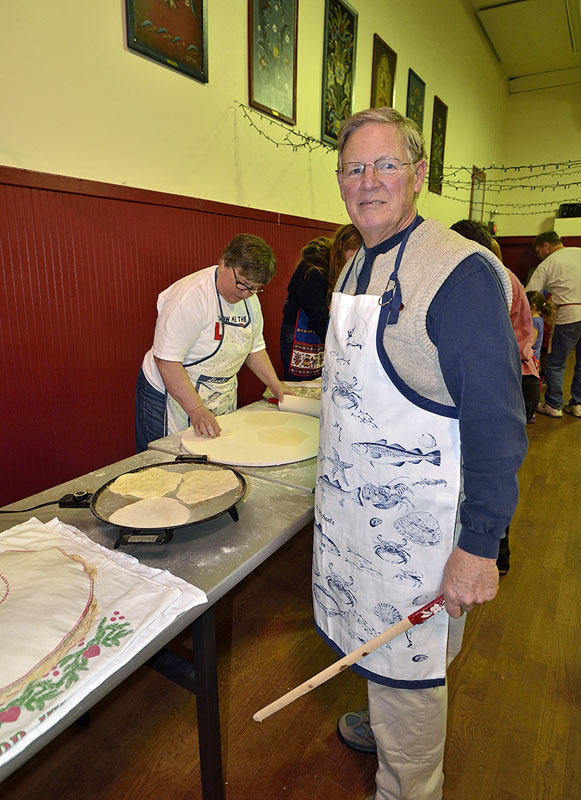 The men were asked to come at 1pm to help with the lutefisk, and the women were asked to come a little later to roll Lefse. Lefse is best described as a Norwegian crepe, usually made from potatoes. 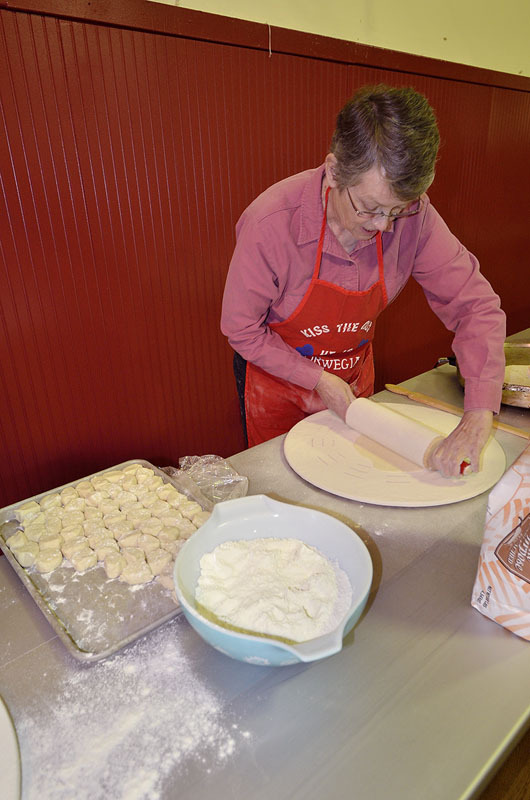 Our valiant harbormaster Glo made the lefse dough ahead of time – from 50 lbs of potatoes, put through a ricer twice along with flour and butter to make a sticky, delicate dough. 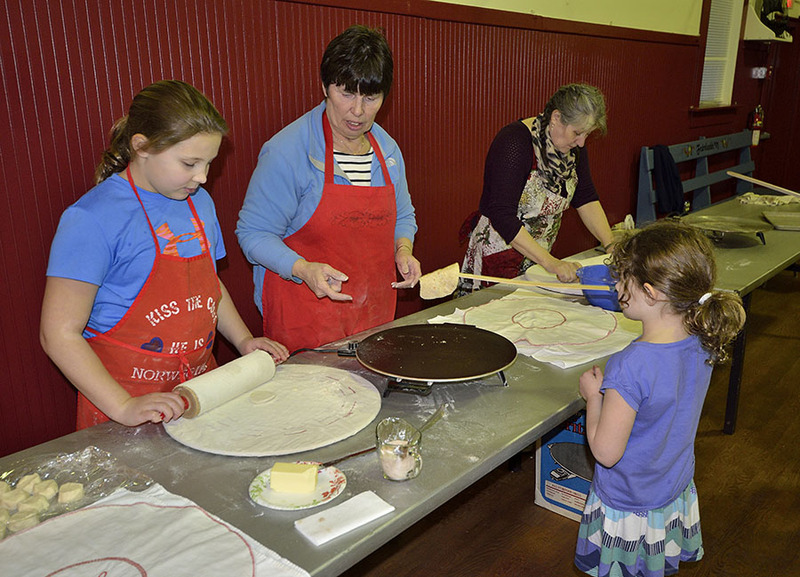 Long tables were set up and the local ladies brought their special lefse griddles, boards, and rolling pins. Bev is showing her skill for getting wafer thin rounds… …and there were helpers of all ages – some teaching the proper technique and some (like me) learning. Jim finished some of his lutefisk duties early so he grabbed one of the special turning sticks and jumped in to help. It was a real community effort, with at least 14 people working together, laughing and telling stories. 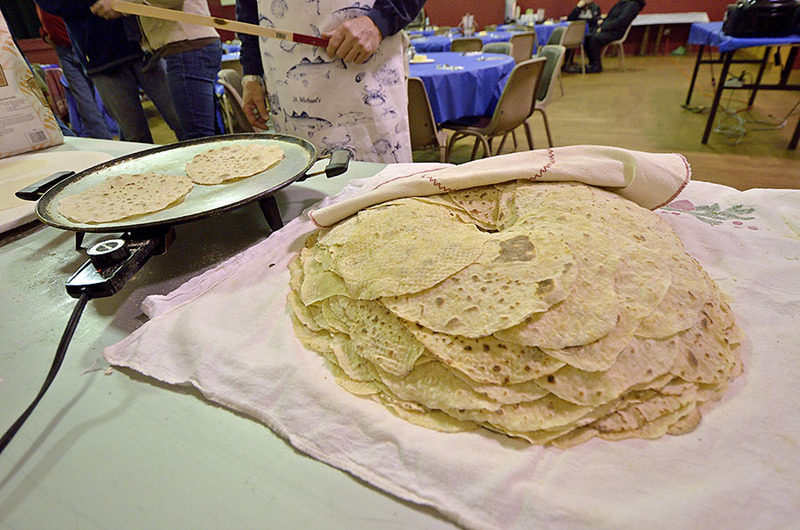 In the end, we made about 500 lefse for the dinner, and finished just before the buffet started. Occasionally we got a mutant lefse that was just too ugly to serve, so the old hands showed us newbies how to eat them – with a little schmear of butter and a sprinkle of cinnamon sugar, rolled up. Mmmmm. The lutefisk preparation was less exciting to watch since a lot of the work had been done in the days beforehand. The fish was red snapper donated by a local fisherman and processed by a fish processor in town. 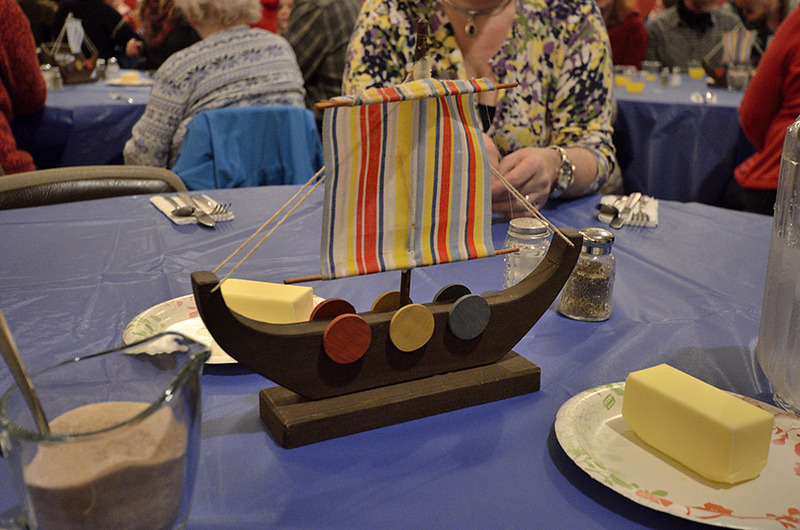 We had 140 members and guests of the Sons of Norway, with people contributing salads, side dishes, and desserts to go along with the lutefisk and lefse. As usual there were lots of beautiful Norwegian sweaters on display, including the one worn by our funny friend Grant. The buffet included ham for those of us who don’t eat fish (like me) or for those who just can’t stand lutefisk. Regardless of the sometimes strange cuisine, it’s good to be a viking. We had the big snow storm last weekend which cancelled the Parks & Recreation Department’s annual Run for Chocolate – a 5K run where the entry fee is a chocolate dessert. All the entries are awarded to the runners in the order in which they finish the race, presumably with the best desserts (just desserts?) going to the fastest runners. Why not forget the running and just go straight to the chocolate (which is apparently what happened because of the cancelled race – a lot of people had already made their entry fee desserts). Sometimes a snow cancellation is a good thing, though bad cooks who are good runners might have been hoping to trade up. 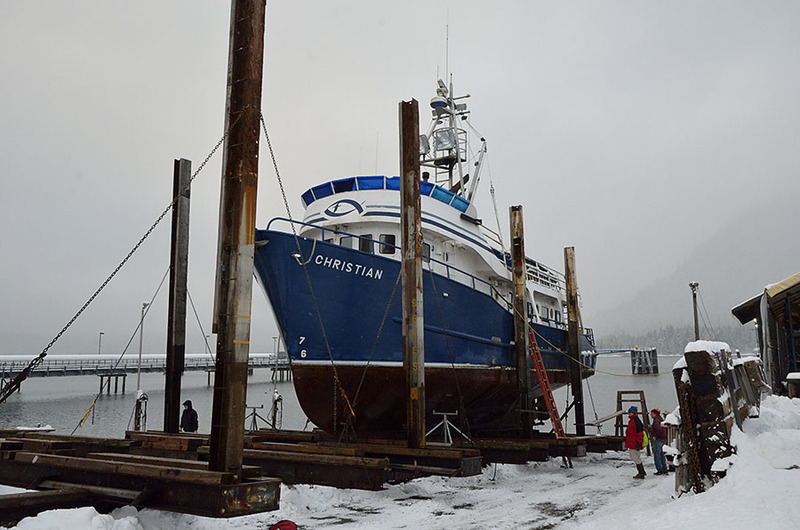 This past week we helped a friend who is caretaker of a 72′ steel converted fishing boat called the CHRISTIAN. 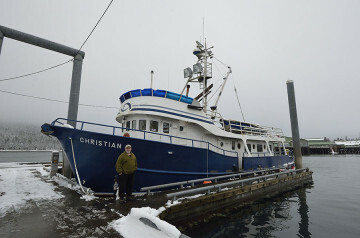 The CHRISTIAN had been a Lutheran missionary boat traveling around southeast Alaska for many years, but it’s now for sale. The boat needed to be hauled out for some maintenance and a Coast Guard inspection, and we were invited to come along for the short ride to Petersburg’s marine railway. 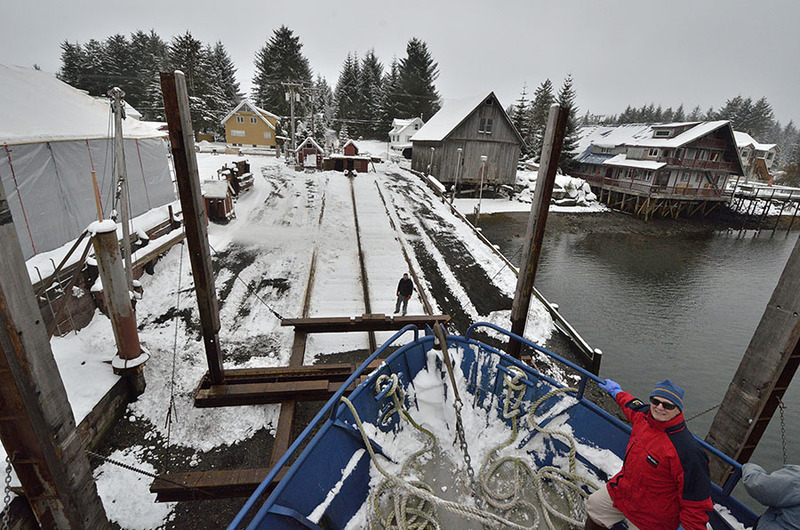 Our friend had already shoveled the decks and made things easy, but the snow started back up as we headed to the railway, squeezed between the Coast Guard station and the big ferry dock, with a good current running. 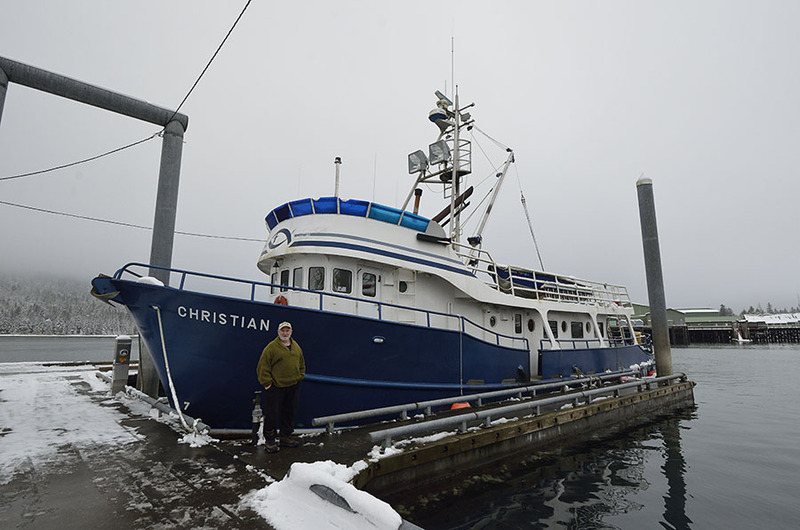 The temporary skipper of the CHRISTIAN is a retired Alaska State Trooper who used to run one of the state’s patrol boats, among many other interesting duties all over Alaska. We were impressed at his ability to handle such a big boat that he’s not very familiar with, threading it into the narrow uprights of the railway in the strong cross current. Jim and I were able to give some volunteer time to help spruce up the CHRISTIAN, and in return we were able to spend more time with the retired Trooper and his friend – both nice guys with great stories. Hopefully working on someone else’s boat will help motivate us to get more active with our own long list of boat projects. 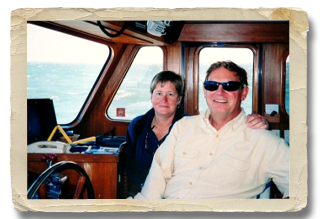 Less time rolling lefse, more time in the bilge. 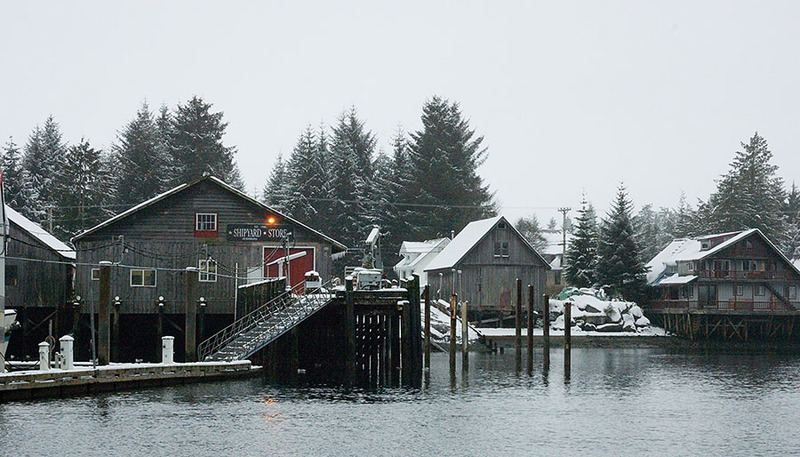 It’s snowing – our first snow since a few inches in early December. Winters in Petersburg are usually pretty mild, but this has been an unusually warm and wet one – we set a record for rain in January with 21.03″, but it looks like we’re going to get more typical weather this month. We need the snow pack to maintain the salmon streams through the summer months, so some white stuff would be welcome in the higher elevations, at least. It’s almost pegged at the bottom – around 970 mb, and that’s a very low low – no wonder our sinuses were complaining! Winds out in Lynn Canal (between Juneau and Haines) were out of the north at 61 knots, gusting to over 90. 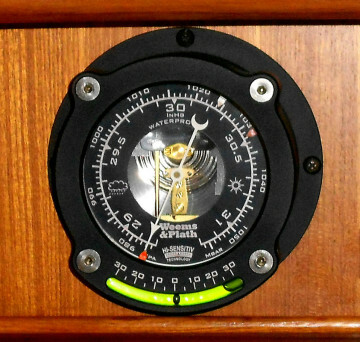 Fortunately we’re well protected from wind with all the mountains around, and it’s good because we don’t have the kinds of mountains where we have to worry about williwaw winds that can hammer down a steep slope. 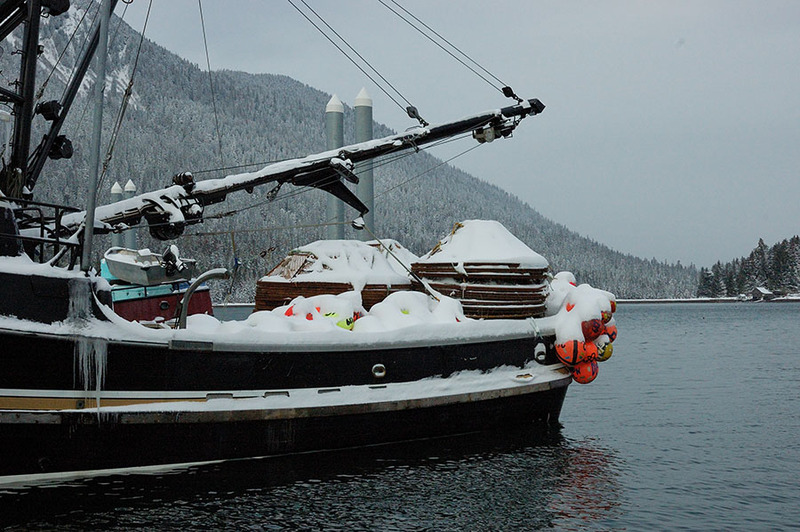 Before the snow started I took a photo of another neighbor’s fishing boat with a full load of huge crab pots loaded aboard… …and it was interesting to see them covered in snow. 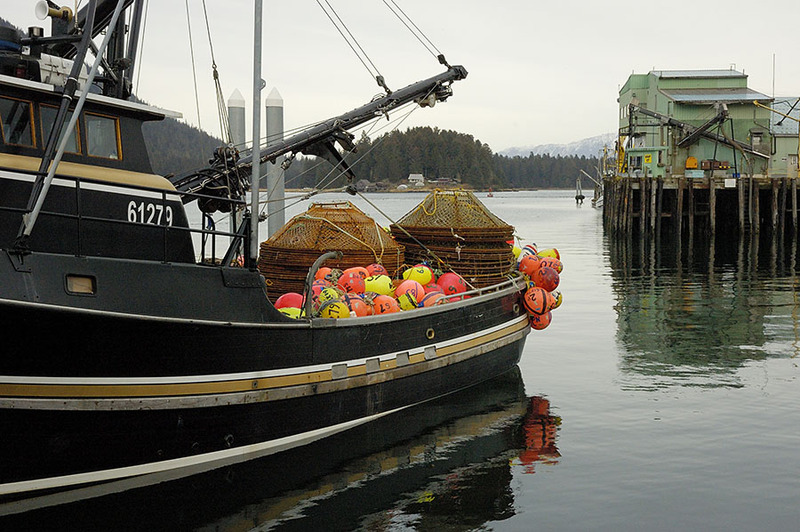 The crab season starts in another week, and I’m sure the fishermen are hoping the weather eases. We’ve had so little snow that it’s still fun to shovel it and to venture out in it. We have all the right clothing and the town does a good job of clearing the streets. There are a few spots on the waterfront where the plows can push the snow right into the harbor, so it’s not a big deal. Keep in mind that our temperatures are far warmer in the winter than what the mid-west and mid-Atlantic states have been experiencing. 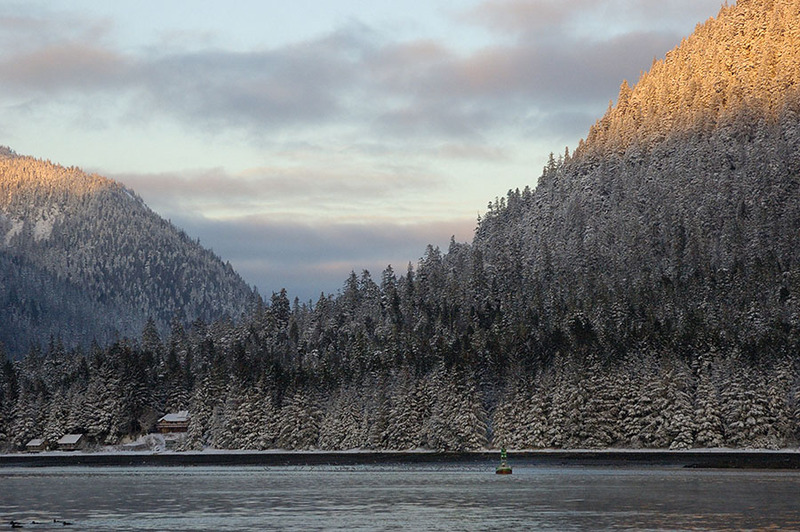 Only our Floridian friends have the right to razz us about wintering in Alaska. The snow has dusted all the trees on the mountains around us with pretty white, and the scenery all around us is so beautiful. 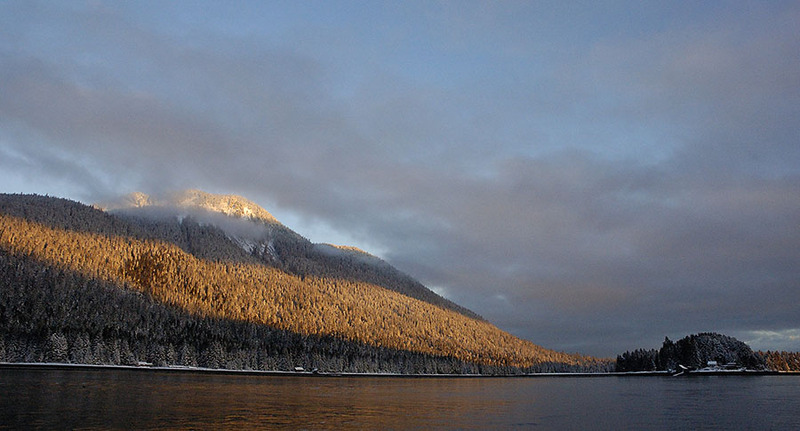 This is Petersburg Mountain in the early morning light… …and here’s looking across Wrangell Narrows to Kupreanof Island. 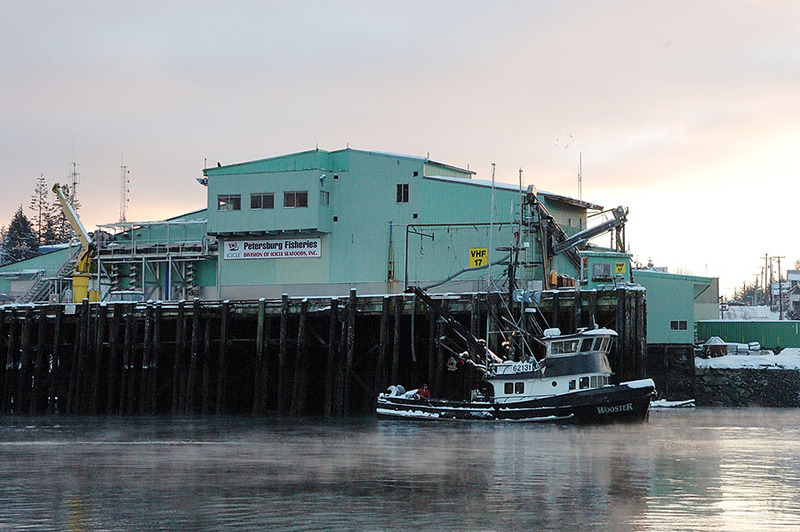 A few fishing boats are moving around the harbor despite the snow, and with three fish processing docks in the harbor the activity is ramping up for the crab season. 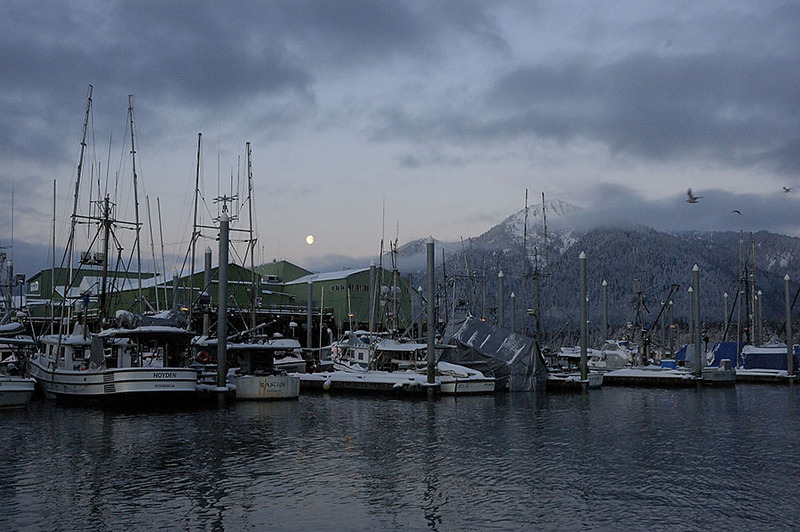 Early yesterday morning I poked my head out the back door of the boat and caught the moon setting behind Bear Claw Mountain. 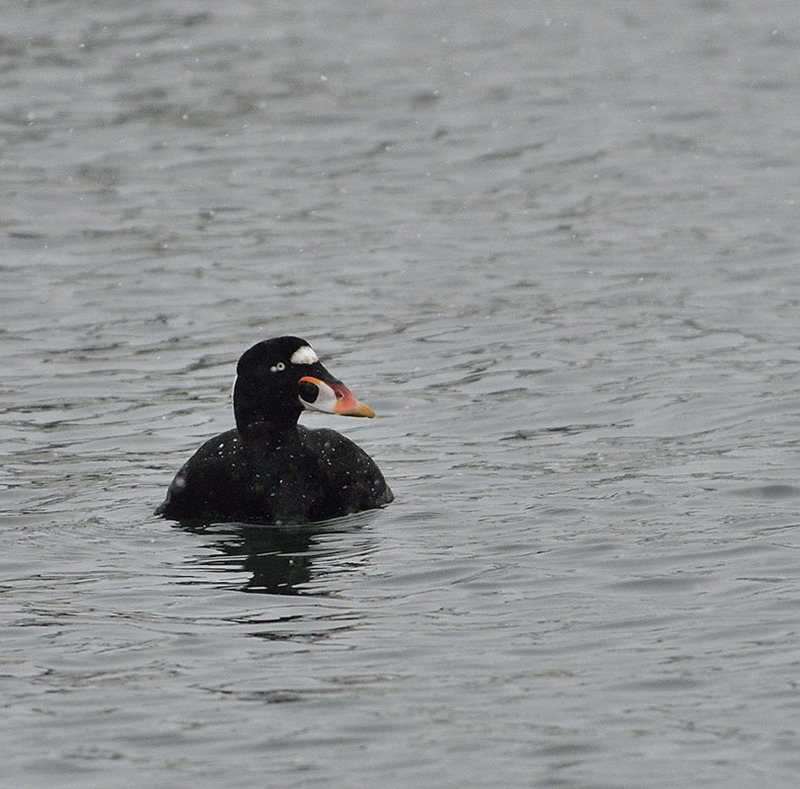 The harbor continues to play host to a large population of scoters… (the white specks are snow flakes) …and long-tailed ducks that are so beautiful. 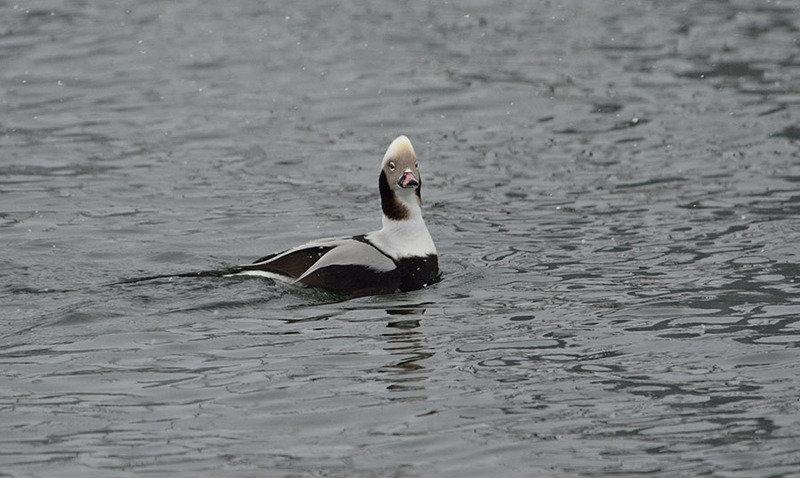 This male seemed to be the alpha bird for a large flock, and he puffed up his crest and kept kek!-ing to the others when I came out in the cockpit with the camera. They all hustled out to the Narrows, but not before he gave me a huffy look. 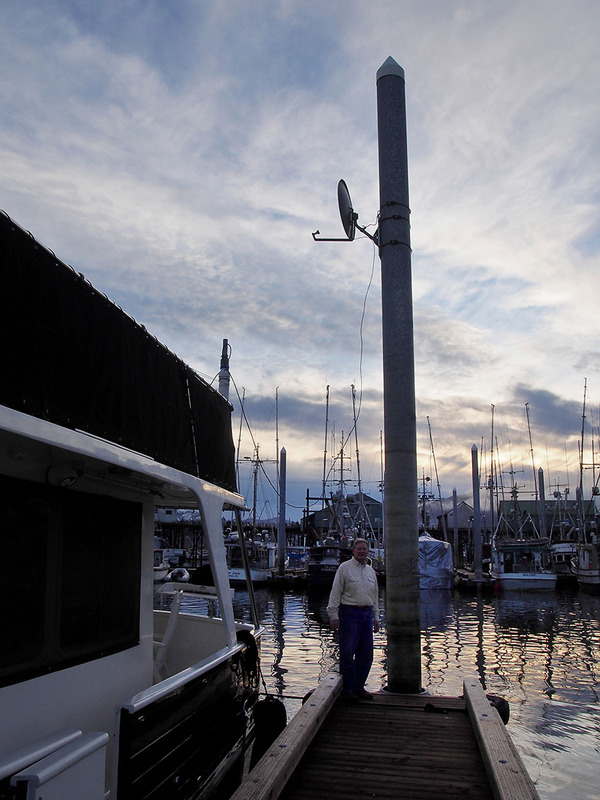 Before the snow started and in time for the Super Bowl, Jim moved our satellite TV dish from the boat to the dock’s sturdy piling. We now have a bigger (30″) dish since it’s difficult to get a reliable signal this far north, especially when there’s heavy rain or snow. It took some careful planning to mount the dish since he had to wait until we had a very high tide to minimize the height of the ladder. In the photo above he was making some final adjustments and the tide had already started to fall. 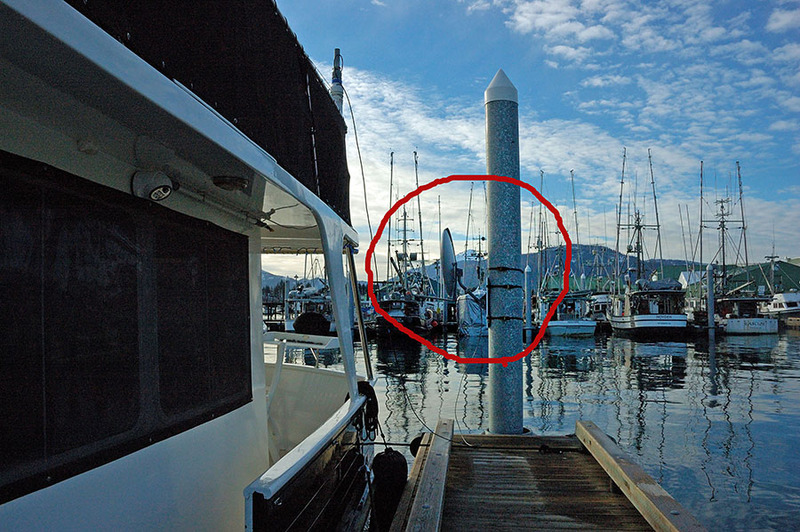 This photo shows where the dish sits, relative to the boat, at high tide. This will give you a little idea about how high the dish is when the tide is low, though this photo does not show the lowest tide we can get when the moon is full or new. 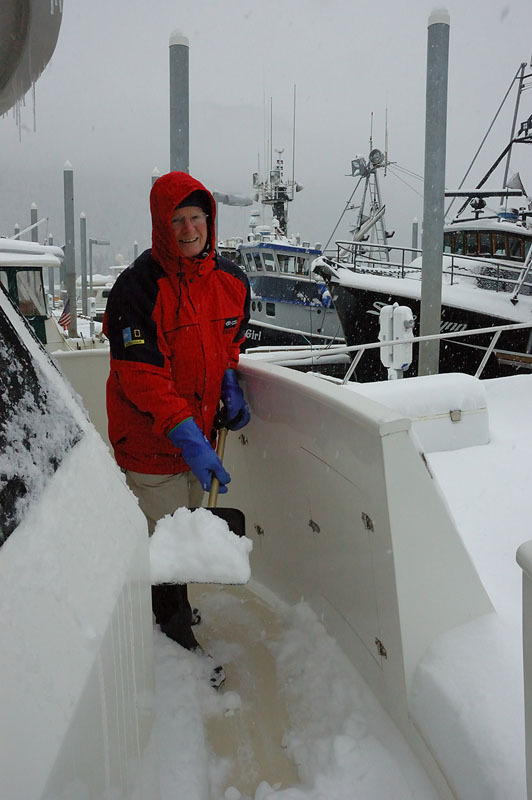 Jim calculated that the maximum tide change we can get anytime in the year is 22-24′, and he arranged the cable to be able to accommodate anything in between. 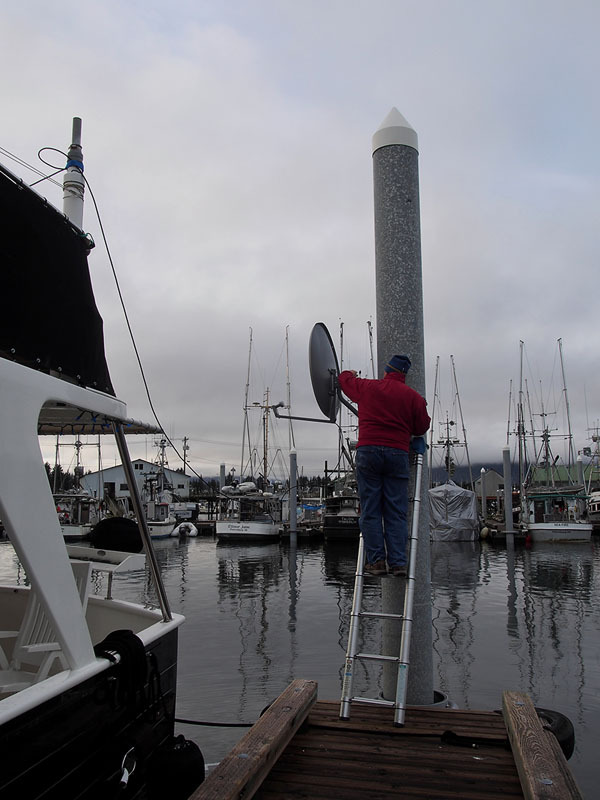 I’m very happy to report that the more stable platform for the dish has improved TV reception tremendously, and I’m sure Jim is looking forward to the start of the cruising season when he has to take the dish down and install it back on the boat.